The first was with Walmart. Walmart has installed special parking spots in their lots, and will offer people free rides to Walmart to pick up online orders. Only some of the 400 Waymo “Early Riders” will participate, at first. The other project involves last mile rides to some stations of the Valley Metro transit agency. This begins only with the transit employees, but will expand to passengers of “Ride Choice” a special heavily discounted taxi service for seniors and the disabled. 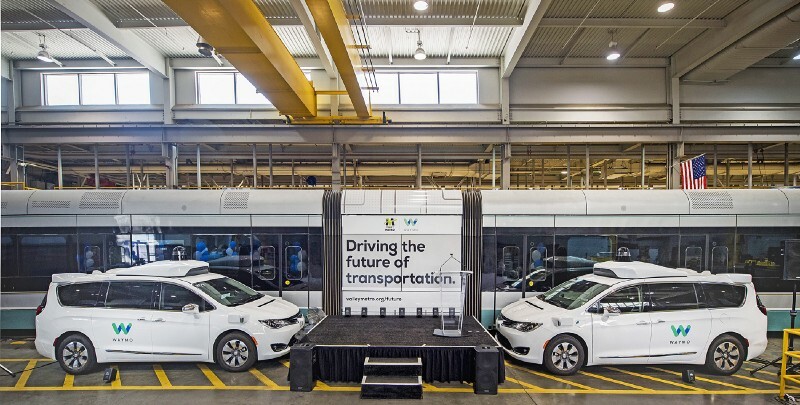 While I’m obviously a Waymo fan (and worked on the project in its early years) I must say these announcements are a bit underwhelming, compared to the big milestone which Waymo has teased for 2018 — rides for the general public, with no safety driver. It is disappointing, though understandable, that Waymo is doing these baby steps. The reality has always been that making a public service is a very hard problem. Waymo has a significant lead on the problem but nobody is fully there yet. I do believe we’ll see it happen in Arizona and a few other places this decade, but in some places it is still several years away. The Walmart project seems particularly unexciting. In fact, since the ride is just to pick up groceries ordered online, it’s hard to imagine why this isn’t more a task for delivery robots. (I work in the delivery robot space with Starship Technologies.) The need for special parking spaces, instead of just taking people to the door, suggests that such navigation at the busy door of a Walmart may be on the more challenging list. The transit project elicits several thoughts. I have always felt that paratransit is a fantastic use of robocars. Paratransit (transit service for the disabled, technically “on demand”) is terrible in the USA. You have to book it a day in advance and wait up to an hour, and it ends up costing cities an average of $30 per ride, nationwide. For the disabled, driving a car can be difficult or impossible, and even riding accessible transit can still be a pain. If anybody needs robocars with cheap taxi rides, it’s this community. On the other hand, I feel that “last mile” applications are wimpy. While they certainly make transit more tolerable, direct service along the shortest door to door route should be what this is all about. As I outline in The Future of Transit this can still be sharing a vehicle, and still involve transfers (but with no waiting or deviation from your route) but the old ideas of lines and schedules and stops should stay in the 20th century. Another underwhelming revelation comes in the interview with the Early Rider. While Waymo is operating vehicles without safety drivers, she reports having only ridden once in such a vehicle even though she uses it very regularly. This tells us that Waymo’s deployment of no-safety-driver operation is still quite limited, and probably only in a limited set of conditions and routes. This again makes sense, but should temper our enthusiasm for Waymo’s progress slightly, though its lead is still almost overwhelming. Nobody else is close to operations without a safety driver on open roads.